Here at Azalea’s we strive to bring you the best knowledge and products on the market to ensure the integrity of your hair. We use one of the best color line in the market, INOA by L’oreal Professional. INOA is a non-ammonia color that uses oil technology to condition and restore the hair to the healthiest hair ever. Our product lines include Aquage, Biomega, Keratherapy, Johnny B and Woody’s. 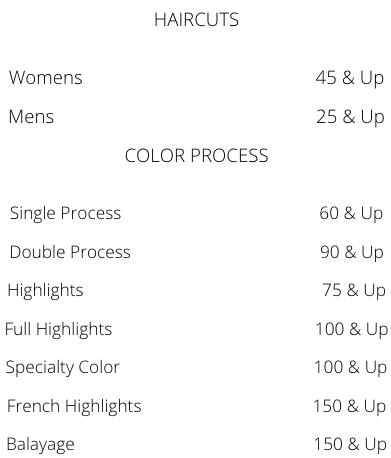 From sulfate and sodium chloride free to colour safe, we keep only the best for our clients. Our team also stays educated year round with up to date classes and education from the industry’s best. 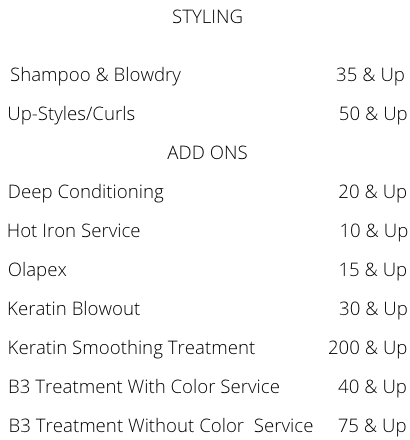 Hair services come complimentary with full scalp wash, massage, condition and blow-dry, excluding up-styles. Sanitation is a key priority for our staff. To ensure the most cleanliness and comfort for our clients, our brushes and combs as well as other tools are cleaned and sterilized after every use. Here at Azalea’s we strive to bring you the best knowledge and products on the market to ensure the integrity of your hair. We use one of the best color line in the market, INOA by L’oreal Professional. INOA is a non-ammonia color that uses oil technology to condition and restore the hair to the healthiest hair ever. Our product lines include Aquage, Biomega, Keratherapy, Johnny B and Woody’s. From sulfate and sodium chloride free to colour safe, we keep only the best for our clients. Our team also stays educated year round with up to date classes and education from the industry’s best. Hair services come complimentary with full scalp wash, massage, condition and blow-dry, excluding up-styles. Sanitation is a key priority for our staff. To ensure the most cleanliness and comfort for our clients, our brushes and combs as well as other tools are cleaned and sterilized after every use.